When we moved to East Harlem from Windsor Terrace in the fall of 2003, we were excited about discovering our neighborhood. As with any major life change, there were aspects of our new situation that we immediately enjoyed, as well as difficulties. We loved the lively feeling of the neighborhood, the small Greenthumb community gardens, the good Latin and Mexican restaurants, and our proximity to Central Park and its glorious Conservatory Garden. In addition, there are several small galleries near us, including that of the street artist De La Vega. As I've mentioned before on this site, shopping was more difficult. Of late we've wandered further afield and have made some great discoveries in the neighborhood. I still travel to other parts of town for what G refers to as my "Organic Gringo" type groceries, but we've also found some little-known but worthy treasures right here at home. 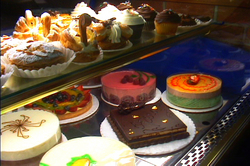 One such discovery was La Tropezienne Bakery. We had for some time mourned our little French bakery in Park Slope, where I liked the buttery apricot danish and G was fond of the apple muffins. G would occasionally stop off there to surprise me on random days with a miniature cakelet or tiny tart when we lived in Brooklyn. We missed it a great deal. 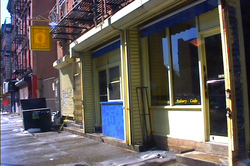 But then one day, as we were walking up First Avenue to the venerable East Harlem Patsy's for a pizza, I saw a bright yellow sign and an unassuming little storefront. I suddenly remembered reading Ed Levine's write up of La Tropezienne in his book New York Eats several years ago. And there it was, and here we were, right in the neighborhood. We feel pretty lucky to have La Tropezienne (named for a luscious custard-filled pastry, available there in two sizes) as our neighborhood bakery. It's a great little place. Perhaps its tarts don't have the insanely buttery fragility of the ones from City Bakery. Its small pastries and cakes are not as modishly original as those at Payard, and there are no handmade chocolates or ethereal green tea or mocha macaroons. But that being said, you will find many of your classical favorites here, made with plenty of honest butter and real cream: eclairs, mille feuille, tarte au citrón; fruit or ganache tarts. Sometimes there are cups made of chocolate, filled with espresso cream or cream custard and berries. 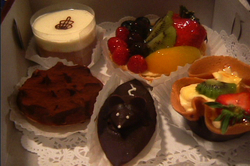 There are puff pastry swans, and chocolate barquettes made to look like mice. 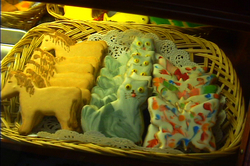 To keep your children amused while you're making up your mind, you can buy iced cookies made to look like a whole menagerie of different animals. In the summer, they always have icy homemade lemonade with a perfect sweet-to-tart ratio. This is probably the only bakery in our neighborhood that doesn't use scary ersatz fillings and frostings: dubious "cremes" and flourescent "fruit" pastes. 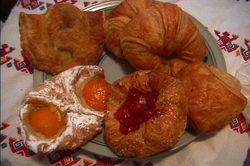 And La Tropezienne's numerous breads, croissants and danishes are all absolutely lovely. I have had many a worse croissant in other places, including Paris. G has also found a new friend in the apple division, since apple desserts and baked goods are his steadfast favorites. It turns out that La Tropezienne makes a superb apple turnover. In addition, you won't pay anything like the sticker prices you'll find in the few high-end bakeries that NYC can actually boast. The owner of La Tropezienne is French, but the store is staffed by young people from the neighborhood. It's been in existence on the same East Harlem block for the past 14 years. At first it seems rather French -- at least to American eyes. There are some little cafe tables and chairs, and a comfy cushioned window-seat table as well, along with the obligatory poster of beret-wearing man and child together on a bicycle, with baguettes strapped on behind. Then you hear the salsa music playing in the background, and the banter in Spanish behind the counter. The neighborhood people drop in for their morning coffee and pastry, and folks stop off to buy breads and cakes, salads and sandwiches. Hang out at La Tropezienne long enough, and you'll get a feel for the neighborhood. People from Haiti and French-speaking African nations often come in, since the bread and pastries are a familiar part of their colonial pasts. We went in for brunch the other day. We ate wonderful Alsatian quiche with smoky ham bits suspended in light custard and a fine croque monsieur and watched the comers and goers: an elderly couple involved in an intense theological discussion (for me, pastry is proof enough of heaven); a man sitting by himself, completely occupied by his crunchy almond-encrusted breakfast treat and coffee; a father with a beautiful but solemn little daughter, carefully holding her papa's hand. "You can have any cake you want, cherie. After all, it's your birthday," he said with a clear French-Haitian lilt. Her eyes widened with joy and she began carefully inspecting the case. "This one, " she said, pointing at a sumptuous raspberry mousse cake. As they boxed it up for her, she twirled around and around in exultation, and it became clear to us that no matter what mood you may be in when you enter La Tropezienne, you always leave happy.